We are looking for volunteers to support the charity and the Know the Score campaign this Bowel Cancer Awareness Month. 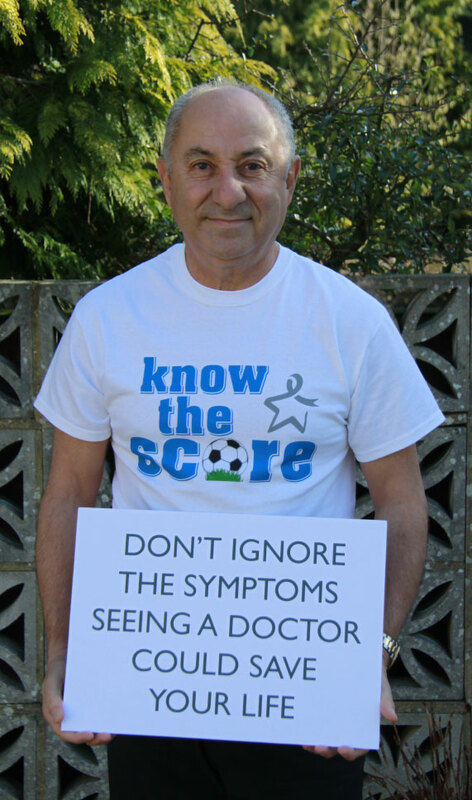 Know the Score sees clubs, charities and governing bodies, including the Professional Footballers’ Association (PFA) and League Managers Association (LMA), unite to raise awareness of bowel cancer signs and symptoms. The main aim is to end the perception that bowel cancer only affects older people - in fact it affects men and women of any age and the key to successful treatment is early diagnosis. The campaign is the brainchild of former Millwall, Charlton and QPR goalkeeper Nicky Johns, whose son Stephen died of bowel cancer at the age of 26. We need volunteers to help us give out pin badges outside the grounds of a number of football matches in March and April, to help spread awareness of the signs and symptoms of bowel cancer. We need two volunteers to arrive by 2.30pm and finish by 5.30pm. We need two volunteers to arrive by 2.30pm and finish by 5.30 pm. We need two volunteers to arrive by 1.00pm and finish by 3pm. We need two volunteers to arrive by 1pm and finish by 3pm. If you or any friends or family would like to volunteer at any of these events, please contact kathryn.nichols@bowelcanceruk.org.uk and include ‘Know the Score’ in the subject line.